Nagaland Chief Minister Neiphiu Rio on Wednesday reiterated that the Naga political issue was the PDA government’s top agenda and extended support to the demand of Naga people for integration of all contiguous Naga-inhabited areas. Rio asserted that his Government had been supporting the ‘legitimate and democratic right’ of the people at all times. 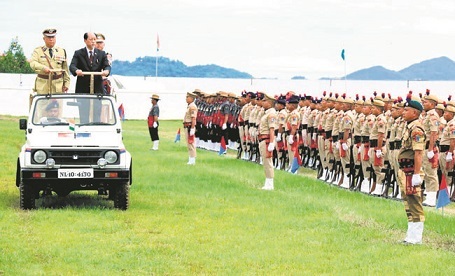 In his Independence Day speech, after unfurling the tricolour at Civil Secretariat Plaza in Kohima on Wednesday, Rio also made a fervent appeal to the neighbouring States to ‘appreciate the history and democratic rights’ of the Nagas in the spirit of mutual respect to live together as ‘good neighbours under an environment of harmonious coexistence and brotherhood’. He said there was no problem that can be amicably solved with ‘collective will’ of the people. Speaking on the recent calamities triggered by incessant rainfall across the State, Rio said Independence Day was being celebrated at a time when the State was ravaged by unprecedented heavy rains and landslides, causing widespread damage to life, property, roads and bridges. He also mourned the loss of 10 precious lives and acknowledged the prompt response of all stakeholders, including the government departments, Association of Off-roaders Nagaland (AON) and common people, for their prompt action in repairing the roads and highways without much delay so that supply of essential commodities was not disrupted.